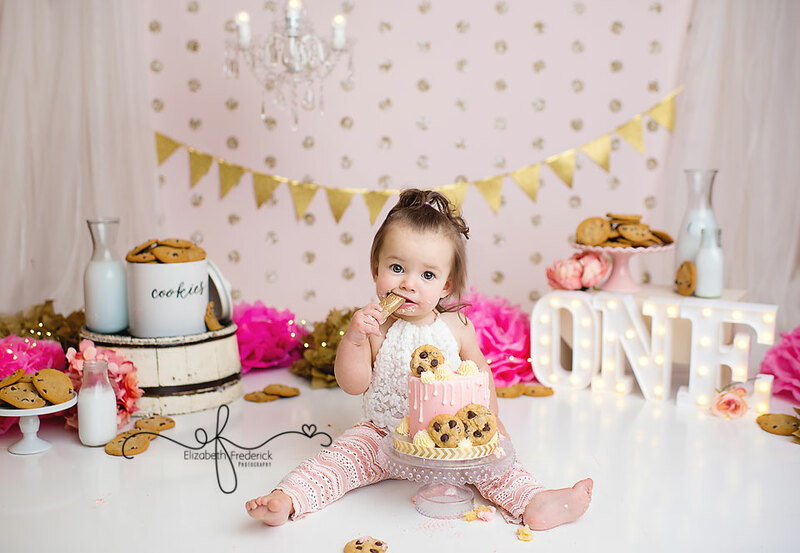 Taylor came to our Meriden Portrait Photography studio to celebrate her first birthday with a smash cake session. These are my absolute favorite way to celebrate little ones first birthday. When mulling over a theme, Taylor’s mom suggested that she was a “cookie monster” and would say she liked cookies more than cake. I knew right then we had to do a cookie theme smash cake. We didn’t really want to do a “Cookie Monster” theme so I went in the direction of Cookies & Milk. I had so much designing this one of a kind set just for Taylor. It was a hit & her mom was totally right, she loved the cookies more than the cake. She thoroughly enjoyed her breakfast treats though. Check out the cuteness below. Cake from the always talented Sara from You’ve Been Cupcaked!